Provide comfort for the family of Angelina DeVita with a meaningful gesture of sympathy. On Sunday, April 7th, 2019, Angelina DeVita, passed away at the age of 99 in Bradenton, Florida. She is survived by her sons Anthony, Henry, and daughter in law Lorraine, grandchildren Christine and Robert, his wife Kara and their 2 children Angelina and Mia. She proceeded in death, her husband Andrea, daughter Anna and son Salvatore. Angelina was born on November 10, 1919, in Brooklyn New York to Catherine & Antonio Mistretta. On June 25th, 1939 she married Andrea DeVita and was married for 58 years until his death in 1997. Angelina had such passion, love, and devotion for her two sons, 2 grandchildren, and 2 great-grandchildren one who was named after her. Our family has fond memories of Sunday Dinners in Queens, trips to Florida, and visiting with her through-out our childhood. Our grandmother loved buying scratch-offs, playing Bingo, cooking, watching her “stories”, reading Danielle Steele novels and reminiscing the “old days” while looking through pictures and sharing stories of our family. She was a loving mother and grandmother to us all. She will be missed dearly. Church Services will be held on Saturday, April 13th, 2019 at Our Lady of the Cenacle, followed by her burial at Maple Grove Cemetary. To send flowers in memory of Angelina DeVita, please visit our Heartfelt Sympathies Store. Chris & Susan Festa sent flowers to the family of Angelina DeVita. Thank you for being the best aunt to me. I will always love and miss you. RIP Aunt Angie. Tony, Our thoughts and prayers are with you and your family. Always remember that the memory of your mothers love will last forever. 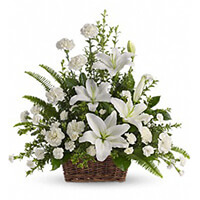 Chris & Susan Festa purchased the Peaceful White Lilies Basket for the family of Angelina DeVita.